March 2018 : Deer Count 2018. The most recent results are now avaiable via the Deer Count page. All Volunteer counters - please contact us as early in 2019 as possible to let us know if you will be able to assist again on that date. Good to see so many volunteer counters and others at this year's Deer Forum, attended by around 40 people. 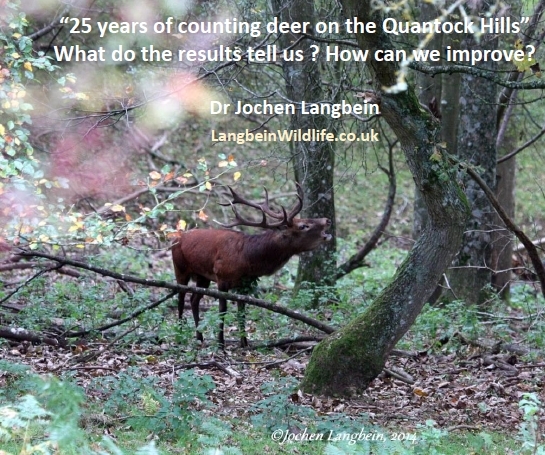 After a gap of a number of years the annual Deer Forum was reinstated this year, and included a talk by Dr Jochen Langbein “25 years of counting deer on the Quantock Hills and what the results tell us.”, as well as a photogrpahic competition, followed by open forum discussion on the state of the Quantock Deer Herds.